Would you like to see them in the flesh without leaving home? Fancy receiving FREE or DISCOUNTED products of your choice? If you answered YES... simply book your own monkey meet! So what is a monkey meet you ask? 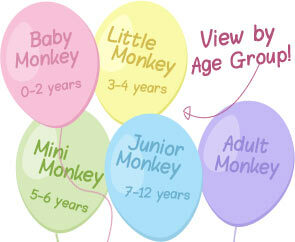 Simply, a ‘SEE, TOUCH, PLAY & SHOP’ session where you, your friends & family can get to know the marshmallow monkey range. With a minimum of 4 adults in attendance, one of our friendly team will guide you through our catalogue to assist you in finding just the right products. A monkey meet is relaxed, lots of fun with no sales pressure and it can be very rewarding for the host. What are the rewards I can earn from hosting my own Monkey Meet? 4) Monkey Mates Club Membership - enjoy 10% OFF your future purchases for a whole year as a member of our Monkey Mates Club...so you'll save $$ long after your monkey meet has finished! How do I go about hosting a monkey meet? Just contact your local consultant or give Robyn a call on 0407 795 837 or email [email protected] and we’ll have your Monkey Meet pack delivered pronto. We look forward to meeting you and your friends soon. Received an invitation to a Monkey Meet? Congratulations, we're sure you'll have fun shopping with a cuppa in hand & at Monkey Meets, delivery is at no cost & delivered direct to the host. Can't make it? No problems, simply place your order via the host & it will contribute towards their host rewards. We look forward to personally introducing you to the monkey range. Attending or hosting a Monkey Meet this month? Lots of new products to brighten your winter, a FREE harmonica with your musical toy purchase, SAVE 20% on a great range of multi-packs, grab your gorgeous wiggly worm for ONLY $2 and more. We look forward to seeing you at a Monkey Meet this month!